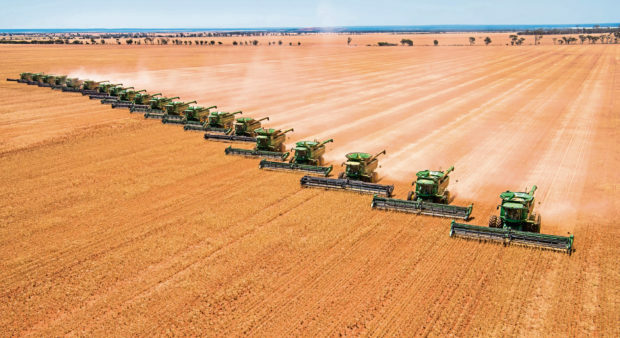 An agriculture investment company based in Saudi Arabia has bought its first farm in Australia extending to 200,000 hectares in the western wheatbelt for more than AUS$60 million. This farm sale represents the biggest offering of a single parcel of broadacre farming land ever to be sold in Australia and is based on more than 30 farms around Merredin, Bodallin, Moorine Rock, Westonia, Southern Cross, Mukinbudin, Bullfinch and Marvel Loch, plus Daisy Downs at Mullewa. The Saudi Agricultural and Livestock Investment Company (Salic) Australia has announced the acquisition of Baladjie Pty Ltd formally owned by grain baron John Nicoletti. John, who also runs six John Deere dealerships, decided to exit farming to concentrate on the machinery side of his businesses. Including the vast land area, Baladjie also carries a 40,000-head Merino sheep flock and was sold following non-objection approval from Australia’s Foreign Investment Review Board (Firb). Although the end sale price was not officially disclosed, sources close to the sale reported the deal was made for more than AUS$60m (£32.76m). Salic KSA CEO Matthew Jansen said: “The acquisition of Baladjie is an important step for Salic as we continue to build our global footprint in a meaningful way. Salic’s head of production agriculture investments, William England, said the local team will build on the legacy of John Nicoletti with plans to manage the livestock and grain production enterprise for the long term with a focus on sustainability, profitability, environmental responsibility and support for the local rural community. Salic Australia is a wholly owned subsidiary of Salic KSA, a Riyadh-based investment company 100% owned by sovereign wealth fund, the Public Investment Fund (Pif). Included in the sale are 76,575ha of freehold land, of which 62,768 hectares are arable.